Stakhanovite shockworkers were workers who, emulating the example of the coal miner Alexey Grigoryevich Stakhanov [03 January 1906 – 05 November 1977], endeavored in their work to exceed the established norms to increase the productivity of labor often to an extraordinary degree. 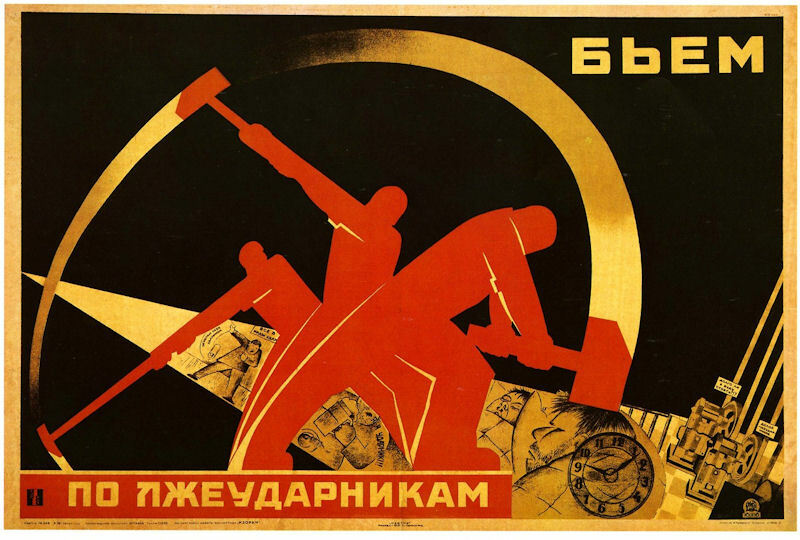 The Stakhanov movement was a mass movement followers AG Stakhanov in the USSR, the innovators of socialist production - workers, farmers, engineers and technical workers, many times higher than the established norms of production. The Movement arose in 1935 and was named for the miner mine "Central-Irmino" (Donbass) AG Stakhanov, who obtained on the night of 30-31 August 1935 for one shift (5 hr. 45 min. ), a total of 102 tons of coal at a rate of 7 tons per hour. It was 14 times more than the usual rate. And subsequently on September 19 he mined a total of 227 tons. It was the beginning of the so-called “Stakhanov” movement. Almost immediately Stakhanov became a national symbol. Within three months, on Nov. 22, 1935, Stalin was addressing the First All-Union Conference of Stakhanovites in Moscow, hailing the movement as conclusive evidence that Communism would triumph over capitalism. 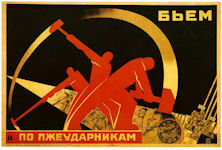 The Stakhanovite movement, Stalin declared, represented "a model of that high productivity of labor that only socialism can produce and that capitalism cannot produce." According to Stalin, the Stakhanovite movement will erase the dichotomy between manual and creative work and inevitably lead to communism. As part of the Second Five-Year Plan in 1935, Stakhanovism spread to other industries. Workers, who achieved Stakonovite feats were honored with medals in recognition of their service to the Party and their contributions to the building of communism. During the first years of the Stakhanovite Movement, Soviet authorities claimed significant increases in industrial productivity. After a Communist Party Central Committee meeting in March 1937 at which skeptics about the Stakhanovite movement were branded "Trotskyist saboteurs" and worse, thousands of them were carted off to labor camps. 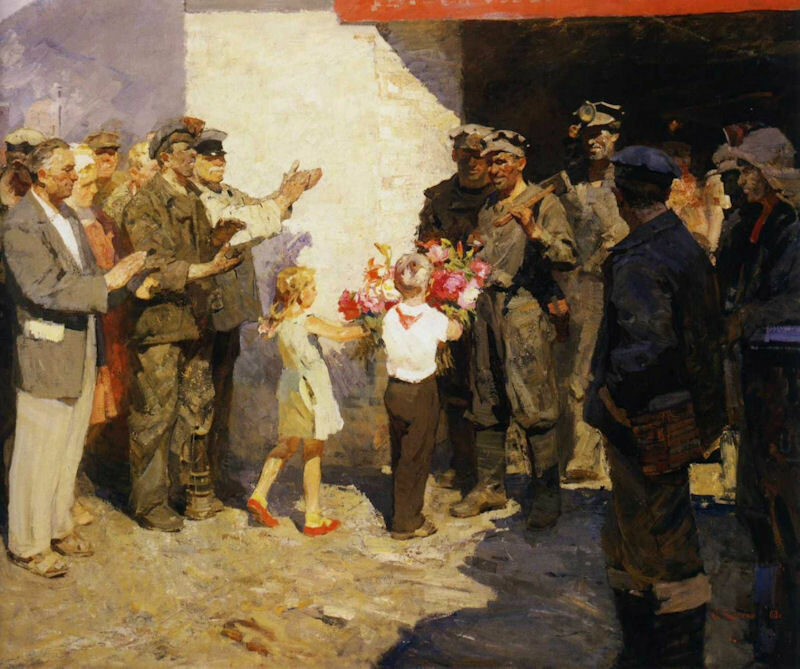 The new “Soviet man” had been a favorite domestic Soviet propaganda theme for some years. Endowed with graces possessed not even in full measure by the twelve disciples, and in some respects strongly reminiscent of Little Lord Fauntleroy, this mythical creature has been extolled by Soviet writers as an example of the beneficent effects upon the human race of the Marxist system. Stakhanov is a city located in the western part of Lugansk region of Ukraine, about 63 km by highway and 91 km by railway from Lugansk. In 1937-1940, the city was called Sergo, before 1937 and in 1940-1978 - Kadievka. Stakhanov is named after the famous Soviet miner Alexey Stakhanov who began his career in this town. The city of Stakhanov belongs to Luhansk region. Stakhanov is situated in the western part of Luhansk region about 63 km by highway and 91 km by railway from City of Luhansk – regional metropolis. Main industries of Stakhanov are mining, mechanical engineering, rail car building, ferro-concrete items production. The railway station “Stakhanov” is located about 7 km from the city border (in the city of Almazna). Stakhanov city population is about 83,000 (2010). Taking into account the circle with radius of 30km with the center in Stakhanov, important cities of Donbas region are located inside the catchement area: Pervomajsk, Alchevsk, Brjanka. The history of Stakhanov began in 1814, when Andreyevka settlement was founded. In the first quarter of the 19th century, coal was found in this area. In 1890, there were five joint-stock coal mining companies here. In 1894, the sugar-making plant owner Shubin founded the mine #1 “Karl”. In autumn 1896, first coal was mined at the mine #1. 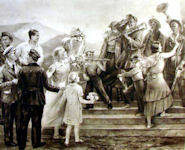 Since 1898, Shubinka was called Kadiyevka. The same year, a metallurgical plant was founded near Almaznaya station and, in 1899, its first blast-furnace was put into process. 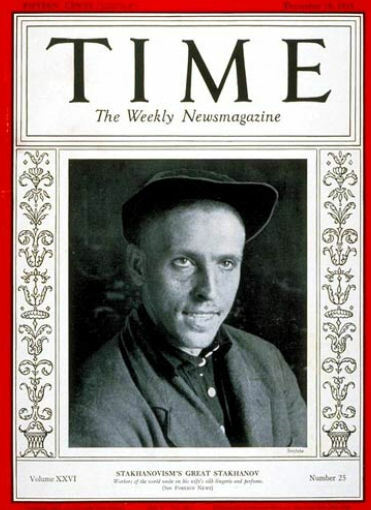 On 24 September 1970 Aleksei G. Stakhanov, the coal miner whose name became the catchword for the superworker in the nineteenthirties and forties, was restored to public attention by being designated a Hero of Socialist Labor, the highest civilian honor. 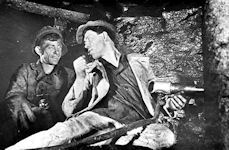 Aleksei G. Stakhanov, the Soviet coal miner of the 1930's whose name became a byword for speedup work both in the Soviet Union and abroad, died 06 November 1977 in Moscow. He was 71 years old. On February 15, 1978, the town of Kadiyevka was renamed into Stakhanov, in order to commemorate the miner Alexey Grigoryevich Stakhanov. In 1970s, there was a mine construction at the territory of former coal mine a site for the development of industrial park has been identified in the South-West corner of the City of Stakhanov. But in 1995 during the restructuring of the coal industry, when all mines in the city were eliminated , the mine construction works were stopped as well; the bores were flooded, all ground facilities were dismantled (except air shaft tower). 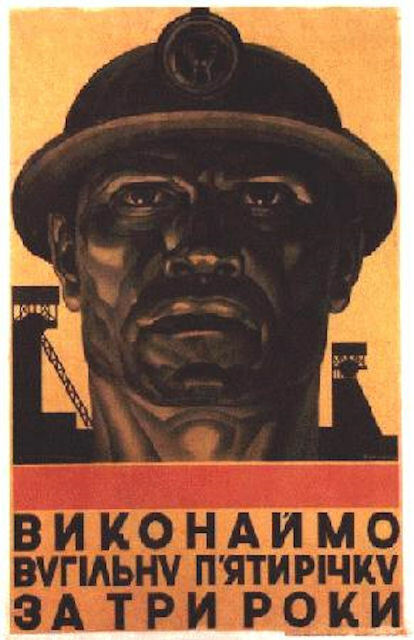 In the last Sunday of August some former USSR countries celebrate Coal miner’s Day. People usually praise coalminers on this day for their hard and dangerous job. Officials congratulate them and many coal miners get medals. They work hard and risk their lives every day, and through blood and sweat they give thousands and thousands of tons of “black gold” providing electricity and heating. The push for Stakhanov's record was carefully planned and prepared by the Communist Party organization of the Tsentralnaya-Irmino mine in the Donets basin. The party tapped Stakhanov, a little-educated, hard-working peasant-turned-miner, to set a record that would become an inspiration and example. To increase Stakhanov's chances, the pattern of work was changed to free him from his usual task of shoring up the tunnel as he dug into the seam. 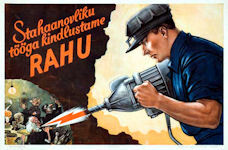 The legacy of the Stakhanovite movement survives today in the regular glorification on television or in the press of "udarniki," workers who have achieved extraordinary feats. But the legacy is probably strongest in the predilection of Soviet managers for what is known as "shturmovaniye," achieving short-term bursts of high production by generating mass enthusiasm and propaganda hoopla.